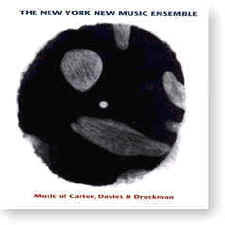 Since 1975 the New York Music Ensemble has emerged as one of the world’s premier 20th-century chamber music groups. Its “extensively-rehearsed and emotionally charged performances” (New York Times) reflect the group’s conviction that contemporary music — thoughtfully performed and ardently performed — can reach both the specialist and uninitiated audience. Each member of the Ensemble is an impressively virtuosic solo performer, featuring established composers such as Milton Babbitt, Andrew Imbrie, Ralph Shapey and Charles Wuorinen, plus talented young composers including Melinda Wagner, David Froom and C Bryan Rulon. Ave Maris Stella, composed by Peter Maxwell Davies for the Fires of London ensemble, invokes religious symbolism — filtered through a 20th-century consciousness — and makes liberal use of Medieval and Renaissance techniques. Elliott Carter’s Triple Duo — also composed for the Fires of London — incorporates six instrumentalists divided into three pairs with each pair (flute/clarinet, violin/cello, piano/percussion) having its own set of materials. A spirit of commentary, imitation and shared gesture, often light-hearted, runs like a thread through the entire work, holding seemingly refractory materials together. Come Round, composed for the Ensemble of the late Jacob Druckman, is — as the name suggests — referring to the “insistent, perhaps obsessive cyclic” returns of musical material within the piece. It uses returning melodies and harmonies to create anchors and relies upon the notions and practices of both tonal music and the experimentalism of the past, paying homage and building upon it. Most importantly, this recording bids farewell to the late Robert Black, the group’s founder and brilliant conductor, a major figure in the New York City new music scene. Recorded (#1-3) 20 September 1992 at Skinner Hall at Vassar College in Poughkeepsie, New York; (#4) 17 November 1991 at SUNY Purchase; and (#5) 18 November 1990 at SUNY Purchase.